You better watch out, Santarchy is coming to town this weekend. That means hundreds of men and women dressed in Santa suits will descend San Diego's streets Saturday at high noon to take part in what the event organizers call "Kringle Kaos and Holiday Hedonism." 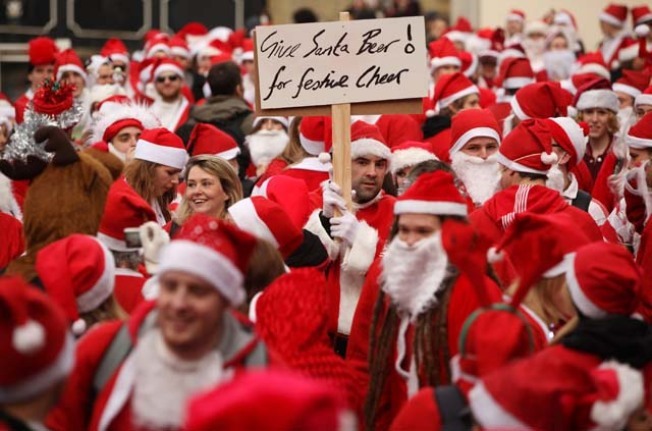 Santarchy or Santacon events are held in just about every big city in the country and many more around the world. This 21+ event began in 1994 when a few friends decided to visit downtown San Francisco for a night they titled "Kringle Kaos." That night has evolved into a worldwide phenomenon. The dress code is simple. Duh? Wear a Santa suit. Many Santa's carry bags of naughty goodies to hand out along the way. The Santarchy organizers have a four "f" list of things you should not do. Don't "f" with police, kids, security or Santa. In the past, most revelers stick to those principals. They are clear that Santarchy is "not a movement." They say it is also not a protest against Christmas or commercialization. "Really, it's just a bunch of Santa's getting together to have a good time." The Santa-bration begins at exactly 12:00 at the Balboa Park Fountain. All late Santas will rally at at Nunu's in Banker's Hill at 3 p.m and then Santa's Sweatshop, also known as The Ruby Room at 6 p.m.